Special order item usually ships within 4 -6 Days. 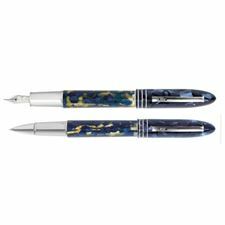 This special set for collectors includes both the fountain pen and the rollerball. Only 100 numbered pieces are available in sets. The 360 Lucens Limited Edition celebrates the tenth anniversary of the extraordinary 360 model, a model often imitated in vain, that combines tradition and avant-garde design. 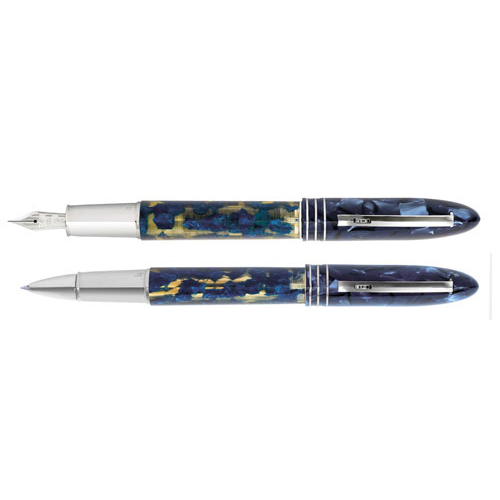 The fascination of the transparency and colour of the celluloid in the legendary Extra Lucens Anni 30, a milestone in the company's history and one of the pens most sought-after by collectors, made using the original techniques of those times, gives unique value to the pure design of the model. As in the Extra Lucens, it is embellished by three fine darts, while the specially designed clip symbolises both collections with its "wheel" end and dynamic lines. The elegant nib holder is the perfect accompaniment to a symbolic nib engraved with the two significant dates, 1996-2006. The fountain pen is being produced in a numbered run of 1000, including 500 with uneven numbers with high-tech finish and 500 with even numbers with a golden finish, together with 360 rolling balls, 180 high-tech and 180 vermeil following the same numbering scheme.